1.Prepare Crust: Adjust oven rack to middle position; preheat oven to 350°. Wrap exterior of 9-inch springform pan, including base, in double layer of aluminum foil; spray pan with nonstick cooking spray. 2.In small bowl, combine cookie crumbs, butter and sugar; press firmly onto bottom and 1-inch up sides of prepared pan. Place on 17 x 12-inch rimmed baking pan; bake 8 minutes or until firm. Remove springform pan from baking pan; let cool. Fill baking pan in oven halfway with water; close oven. 3.Prepare Filling: In large bowl, with mixer on medium speed, beat cream cheese 4 minutes or just until smooth; scrape down sides of bowl with rubber spatula. Add sugar and beat 2 minutes or until combined; scrape bowl. Add pumpkin, pumpkin pie spice, vanilla extract, cinnamon and salt; beat on medium-low speed 1 minute or until combined. Add sour cream and beat 2 minutes or until combined; scrape bowl. Add eggs, 1 at a time, beating 30 seconds after each addition; scrape bowl. Add 1 cup cream; beat on low speed 1 minute or until combined. 4.In small saucepot, heat remaining 1/3 cup cream over medium heat 1 minute or until tiny bubbles appear around sides of pan and cream steams but is not boiling (about 185°); remove from heat and add chocolate. Let stand 2 minutes; whisk until combined. Stir 1 cup pumpkin mixture into chocolate mixture until well combined. 5.Pour remaining pumpkin mixture into Crust. Using a tablespoon, drop heaping dollops of pumpkin-chocolate mixture over top of pumpkin mixture (some mixture may sink). 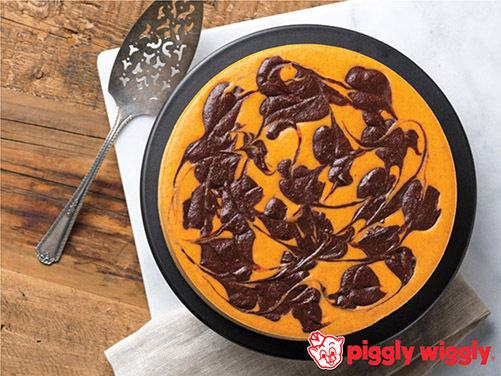 With a wooden skewer or toothpick, swirl pumpkin-chocolate mixture into pumpkin mixture to create a marbled effect. 6.Carefully place springform pan in center of water-filled baking pan in oven. Bake 1 hour 20 minutes or until edges of cheesecake are set and center jiggles, rotating cheesecake halfway through baking time. 7.Remove foil from pan; cool on wire rack 1 hour, then refrigerate 3 hours or until cold. Cover and refrigerate overnight. Run small, sharp knife around edge of cheesecake to loosen; remove outer ring of pan. Cut cheesecake into slices to serve.